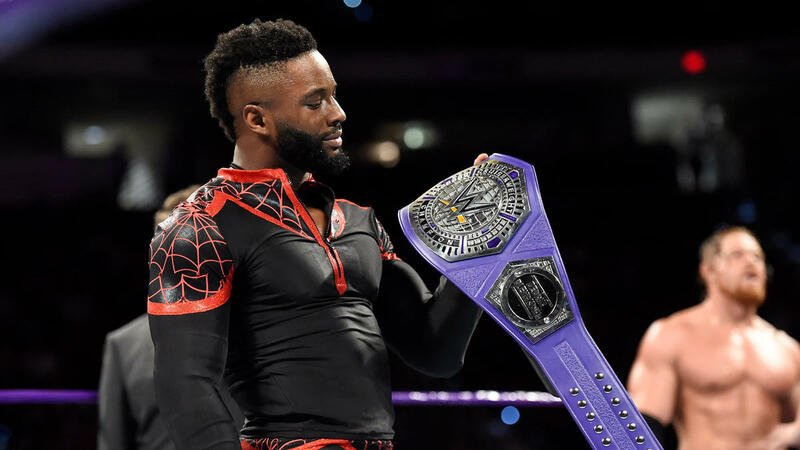 This week's 205 Live is all about the big main event between Buddy Murphy and Cedric Alexander for the Cruiserweight Championship, even cutting down its usual three-match episode format to two just to make it extra long. I'm happy about this. In a PPV system where there's no longer any space for the Cruiserweight Championship because they're co-branded, I'm totally fine with 205 Live getting extra-special episodes. In fact, I'd even be okay with it if they were able to make space for the title match taking up the entire hour, but they had to stick in an extra match just to facilitate backstage vignettes. It's a match designed to finish the story they've been trying to tell over the past couple of months, ever since the Cruiserweight Championship tournament before WrestleMania: Buddy Murphy is here. He's here, he's dominant, but hey, Cedric Alexander has scratched and clawed to get to this point too, and he's just better. That's why he's the champ right now. There were parts in the match, however, where Cedric seemed a little too good. I know we live in the age of multiple big-move kickouts thanks to NJPW and the indies, but Cedric's finishing stretch felt a little too lucky. A superhuman Cedric brushes off a powerbomb after other moves to hit a couple of Neuralyzers and the Lumbar Check. It tells you that Murphy needs to hit Murphy's Law to close out the deal, but Cedric powers through it like he was only hit with pillows. It was too soon to see Cedric drop the title, but I wish Murphy did some more lasting damage. Despite my nitpicks, it's great to see a match of this quality get the time it needs to unfold on a show like 205 Live. Now you know that they're willing to make these concessions, and that they've got the freedom to do that as well. When others get to step up to the plate, they'll have this same chance too. How many more battles between the Lucha House Party and the three ground-based gentlemen are we going to get until we finally get somewhere? What is Gulak going to do? Why couldn't he have just feuded with a face Tony Nese instead of this? Plus points for managing to sneak in the TJP story via a Drake Maverick interview. What happens to Hideo Itami and Akira Tozawa now that their feud is done? So many pieces still left to move here. Hold up, did Nigel McGuinness actually call them "soccer" kicks? I thought he was an Englishman? The status quo remains the same after Cedric successfully retains, but considering the minimalism of this week's cruiserweight action, what changes will the Smarkometrics Experience Xtreme track? Cedric Alexander (no movement) — Cedric solidifies his spot as the top cruiserweight after a decisive defense against Buddy Murphy. Buddy Murphy (no movement) — Fights hard, but doesn't manage to win. Drew Gulak (no movement) — Gulak keeps his spot after helping his new boys Kendrick and Gallagher beat the Lucha House Party. Brian Kendrick and Jack Gallagher (#5 last week) — Beats Lucha House Party for the second straight week in a row to move up the rankings. Mustafa Ali (#4 last week) — No appearance this week causes him to slide down the rankings. Kalisto (no movement) — All of Lucha House Party keep their spots due to the lack of booking of the other cruiserweights. Lince Dorado and Gran Metalik (no movement) — See Kalisto. Tony Nese (new) — Beats Akira Tozawa on this week's Main Event. TJP (#9 last week) — Slides down one spot after not appearing on the show this week, but his movement for better treatment is at least still alive.